In Search for a New Text Editor As I mentioned before, I switched to a Mac a few years ago. After doing so, I realised that Notepad++ is not available on OSX. That was the reason to start searching for a new text editor that would be somehow similar to what I was used to. 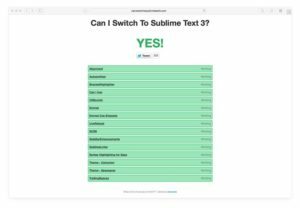 The Text Editor You’ll Fall in Love With Once you install Sublime Text you get something that looks very simple in both UI and functionalities. At first, it doesn’t look that special actually. Why would someone pay $70 for this? But once again, Google has all the answers you need. After taking some time to really get the essence of Sublime Text, I fell in love with it. Here’s my setup. Upgrade to Sublime Text 3 If you haven’t already, you should update to the Sublime Text 3. It’s still in beta but works very well, and package support is also very good. There’s no major difference between the two. At least not on the first sight. But because of numerous updates under the hood, the performance is much better. Install Package Control First of all, I install the Package Control. Without it, it would be much harder and time-consuming to customise Sublime Text. Installation is very simple and quick. Check the instructions here. Theme & Color Scheme After a successful upgrade, I immediately started looking for a cool theme. I need my text editor to look slick and minimalistic. And I really wanted to get rid of that old, Windows Vista like look that Sublime Text comes with by default. To get rid of it, you have to change the theme. Personalisation As I mentioned before, I was using Brackets for some time. Not long, but long enough to get used to some keyboard shortcuts. The two I used the most that had different key bindings from Sublime were delete line and duplicate line. I hate scrolling horizontally, so I wanted Word wrap to be enabled by default. Another search on Google, gave me an answer in less than a minute. I just had to add this line to my Preferences > Settings — User. Packages I don’t want to repeat myself so this is a list of additional packages to the ones I mention in other parts of this article (themes and Package Syncing later on). Can I Use adds a shortcut to your key bindings with which you can quickly check how well is a CSS property supported by browsers. This one goes online to check for that. There’s also a package that provides this offline — caniuse_local. Package Syncing I have Sublime Text installed on two machines: my personal MacBook and my iMac at work. No matter which machine I’m working on, I need my personal Sublime Text setup. I need it to look exactly the same with all the packages on both machines. There is! Or, there are, because there’s a bunch of them. The most popular would be to sync your installation with a little help from Dropbox (I don’t really like Dropbox so I used MEGA instead). And there’s a package you can install that makes it very easy to set this up — Package Syncing.